Distribution-based analytics is a process whereby sales results are adjusted according to the distribution levels of the particular product groups being analyzed. There are two primary areas where distribution-based analytics is used to best effect, which we’ll get into later. Distribution is the most important variable in your marketing mix — and we’re not just saying that. 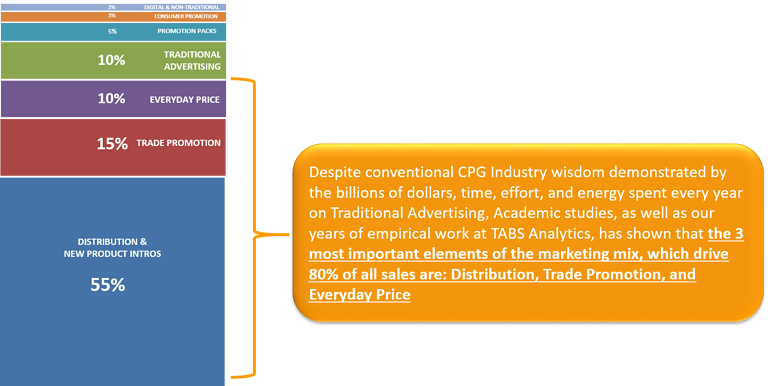 Both academic studies(1) and 18 years of TABS’ own empirical work have shown that using distribution-based analytics is crucial to explaining current market dynamics and predicting future sales trends. Plus, Distribution drives 80% of all sales (in combination with Trade Promotion and Everyday Price). This is often surprising news to CPG businesses when they begin working with TABS, since the below breakdown poses a sharp contrast to the conventional CPG industry practice of pouring money into traditional advertising — which only drives 10% of sales on average. 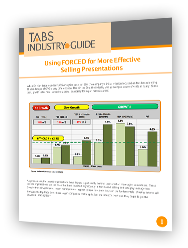 The concept of sales productivity is best illustrated by an example. Knowing that the #1 brand in a category has a 20% dollar share can be helpful, but it doesn’t give you the full picture. Whereas knowing that the 20% dollar share brand has 30% of the SKUs on the shelf gives you a better understanding of the true strength of that brand. Now you can see that it’s over-spaced, relative to the sales it generates, meaning retailers will likely reduce the assortment. Conversely, if a 20% dollar share brand has 10% of the SKUs on the shelf, you can conclude that the brand is very productive. It will have a relatively easy time adding incremental items at retail to further grow sales. This is sales productivity in a nutshell. It’s simply a more accurate assessment of consumer preference for a brand or segment. Sometimes referred to as organic growth, this metric compares the units per SKU (i.e. velocity) of a brand or segment to previous similar yearly time periods. Using the same 20% dollar share brand to illustrate, let’s assume this brand has shown 25% growth versus last year. Great news, right? However, distribution-based analytics also show that the brand grew their SKU count by 50% from last year, while generating only 25% gain in unit sales. This means that the average velocity per item (i.e. units per SKU) actually decreased by 17% [(1.25/1.50) – 1], which means it is now less productive than it was last year. The brand’s underlying trend is actually negative and not strongly positive, as conventional analytics might lead you to believe. 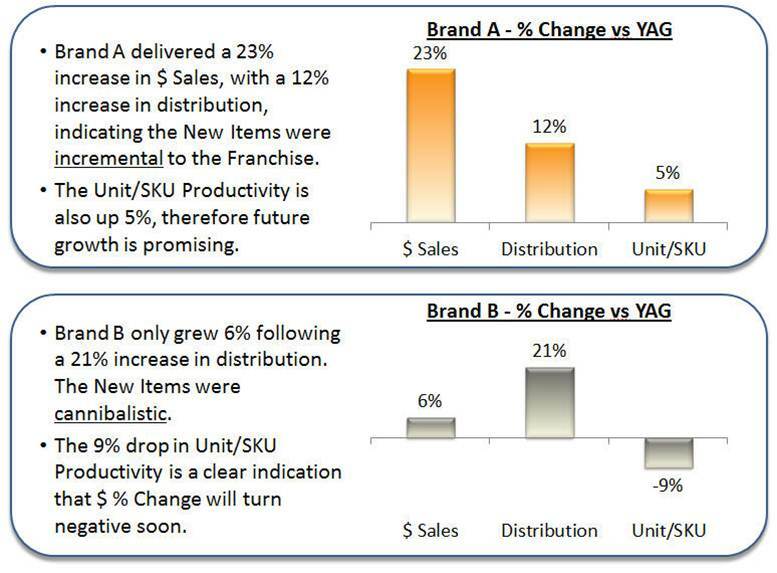 In another scenario, the brand generates the same 25% growth, but this time with only an 18% gain in SKU count. Now we have actual good news! Using our formula [(1.25/1.18)-1], we can see that velocity grew by 6%, year over year. Velocity was not diluted at all — and that 6% growth is highly predictive of future trends for the brand over the next 12-24 months. You can avoid misinterpreting your sales data by using distribution-based analytics to calculate unit velocity change. 1 Ataman, Berk, Carl Mela and Harald van Heerde (2008), “Building Brands,” Marketing Science, Vol. 27, no.6.